My choice of title for this article was made carefully. This is not a general article on outfitting, covering all the many permutations according to country, environment, taste or use. 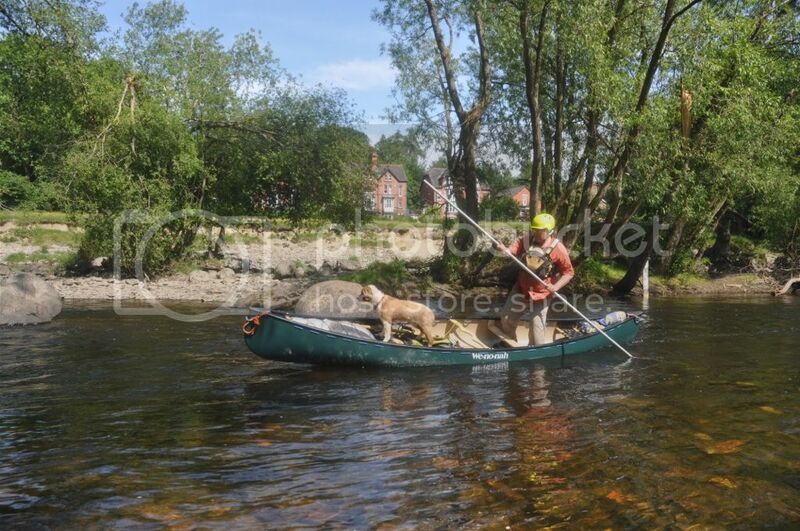 Rather, it is very much about how I outfit my canoe for the work and journeys that I do in the UK and Europe. 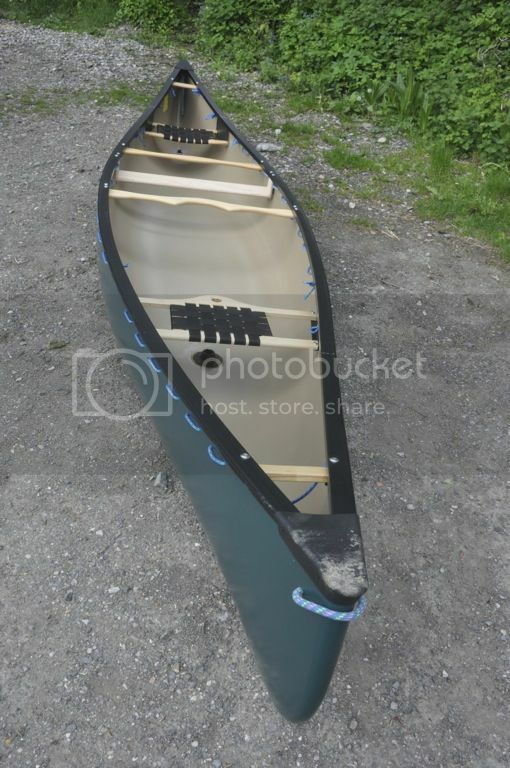 By contrast, if I were outfitting a Kevlar boat for flat water it would be very minimalist. 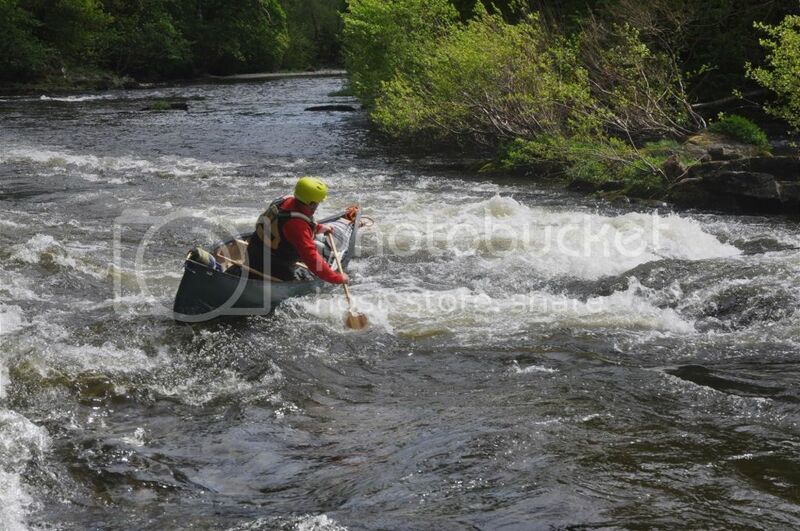 My Wenonah Prospector 16’ is used on white water up to and including grade 3 and open waters with considerable fetch, including coastal. I have been using a similar set-up for some twenty years now. So, I hope in this context, what I have to share will be useful to you and others paddling in similar environments under similar circumstances. The bare boat. 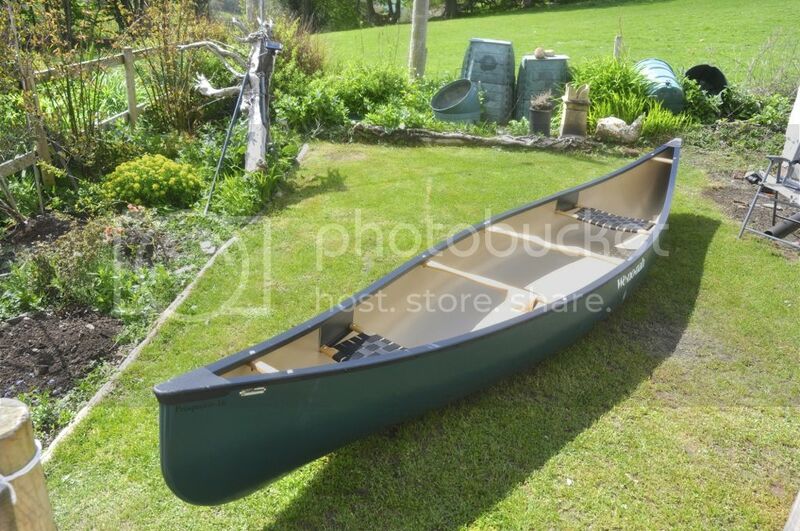 A Wenonah Prospector 16′. 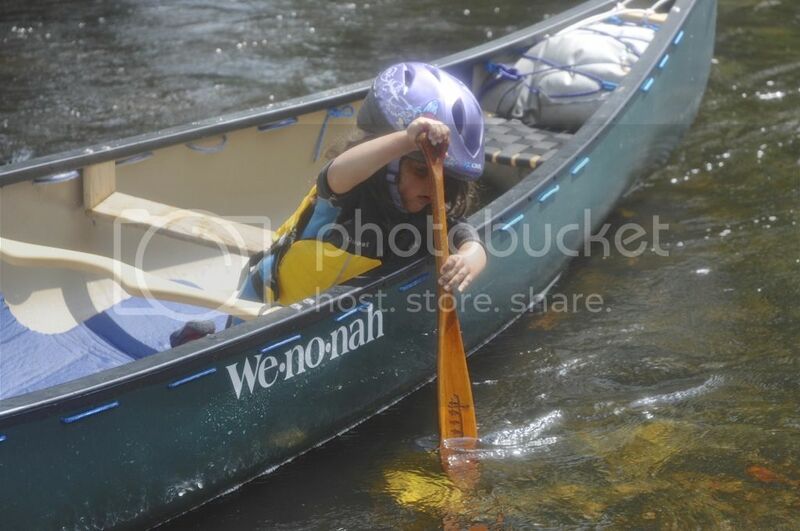 The bare boat: A Wenonah Prospector 16′. It’s a great multi-purpose design derived from a very traditional craft. It has plenty of rocker and a nice shallow arch cross-section, which means I can easily roll it onto its edge paddling solo. Because I want to lash in airbags and other kit we are marking up the side to thread a rope all the way down the side. Marking up the side to thread a rope all the way down the side. I use a three-inch spacing in the airbag area and a four-inch one elsewhere: many others will use an equal spacing but this is what I have settled on over the years. 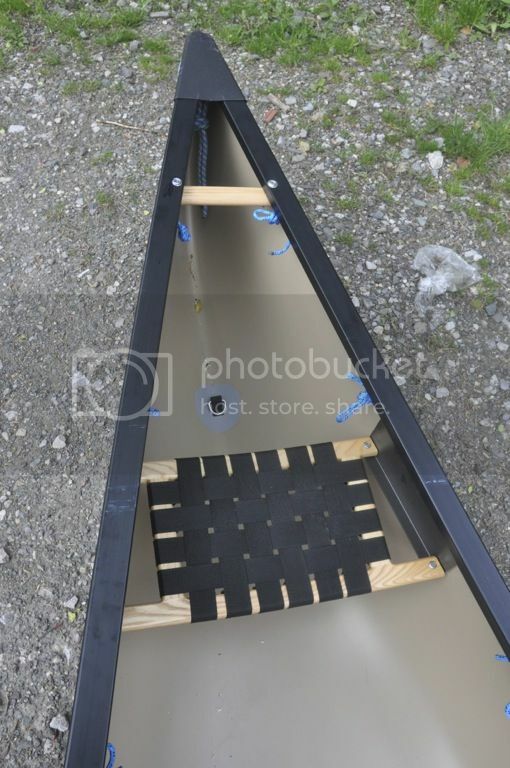 I need the holes far enough below the gunwale to make it useable on the inside but I don’t want to drop it too far as solo I often use the canoe heeled right over and there will be some seepage through the holes. The width of the tape measure seems about right as a marker. With a steady hand Lina doesn’t bother to put masking tape on the Royalex but just drills away. Another hole mark is above the ‘n’ of nah. Feeding the cord through the holes. In the airbag section the cord is looped through the holes and then tightened but leaving a bit of slack to make the inside loops usable. The cord is 5mm climbing cord. 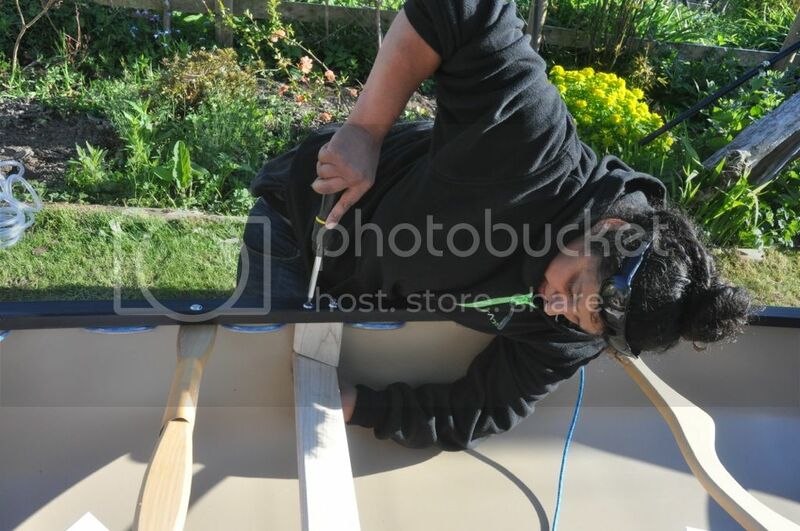 For the middle section we are adding small sections of plastic pipe to make loops on the inside of the boat. 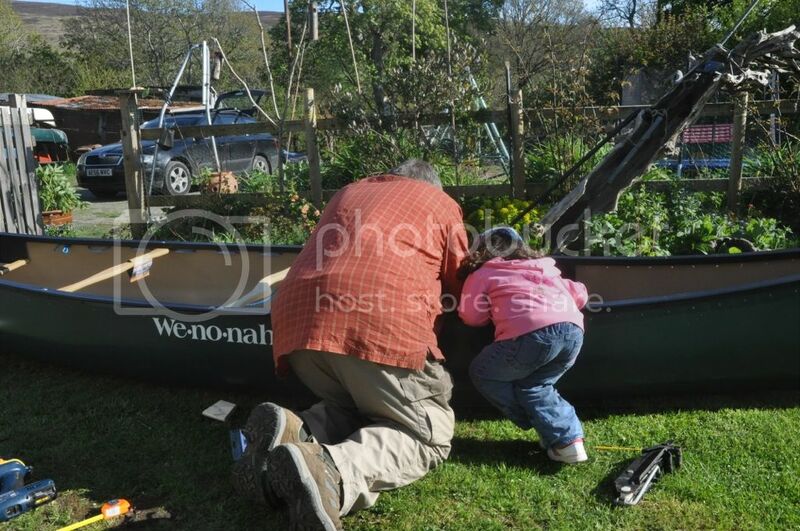 My three-year-old daughter Maya Rose is keen to help. 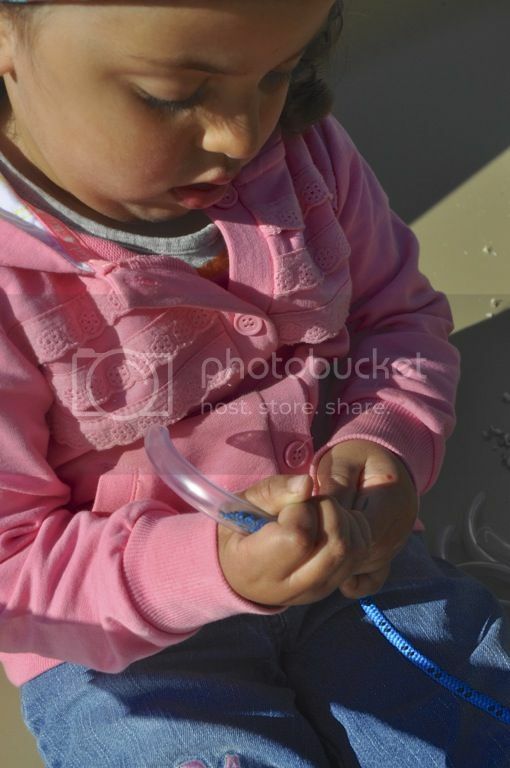 Maya Rose helps with threading the piping. 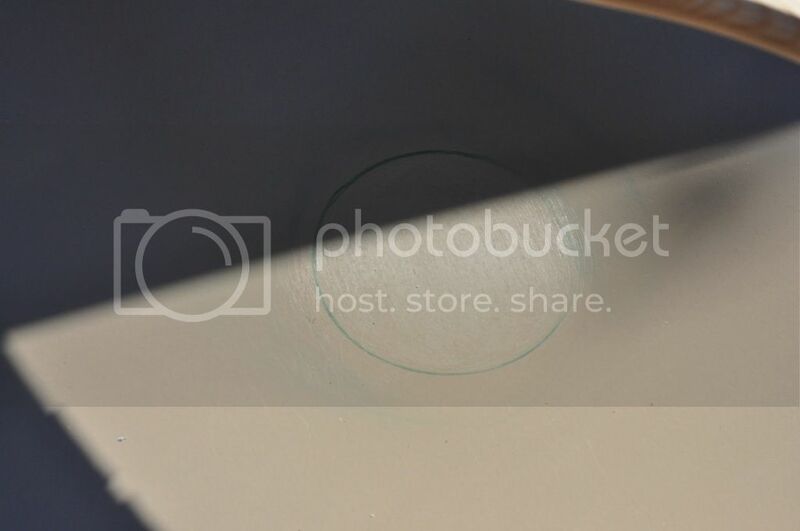 Looped cord with plastic piping on the inside of the boat. 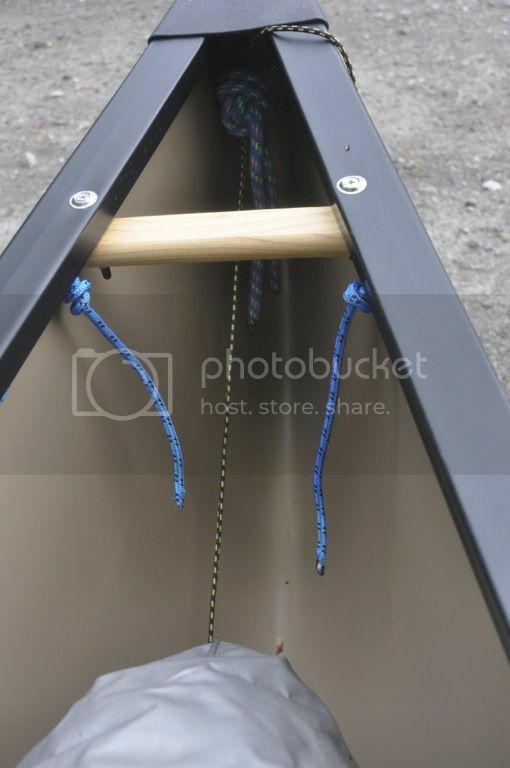 The final knot is on the inside of the canoe as I want the outside clean and tidy. 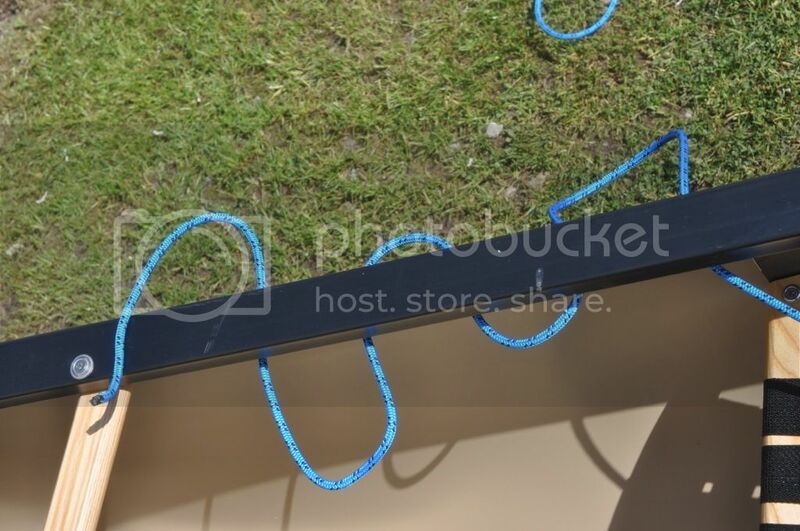 The blue rope is trimmed off close to the knot. 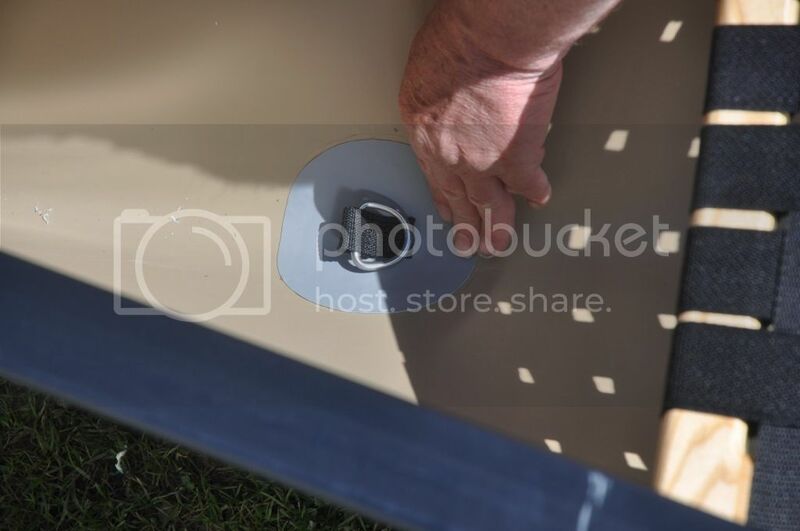 After fitting the cords down the sides of the boat, next is the fitting of D rings as extra security for the air bags. Having chosen the spot I draw around the vinyl D ring patch and then lightly sand both the boat and the underside of the patch. Having chosen the spot I draw around the vinyl D ring patch and then lightly sand both the boat and the underside of the patch. 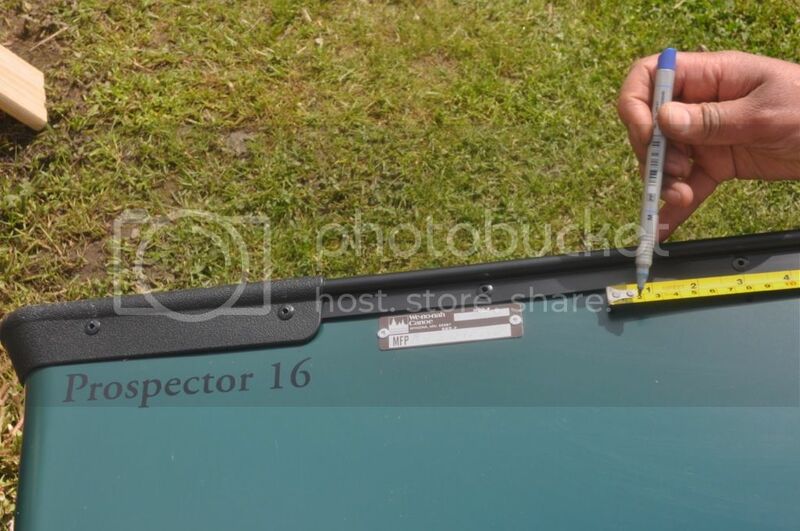 Vinyl Bond is applied to both the boat and the patch and allowed to dry slightly before pressing together. I follow the instructions on the tube! Making sure it’s firmly in place. View of the rear of the boat. The D-ring is situated back under where the airbag will be. N.B. In the above photo, you’ll see that the D-ring is situated back under where the airbag will be and not directly at the end of the airbag. A tape will go from there along the floor around the airbag and then back to the carrying handle to fix the airbag in place. I usually have a small sailing rig in my boats so I need a mast foot and an attachment on the rear of the bow seat. 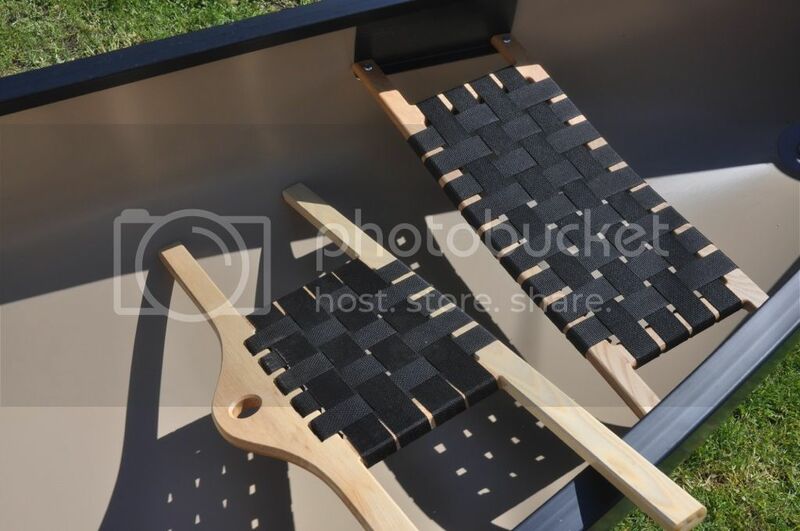 Sometimes I have added a piece of wood below the seat but Endless River have a neat seat that does the job so I am replacing the original. Endless River seat with integral mast hole is very neat and will replace the standard seat in this boat. 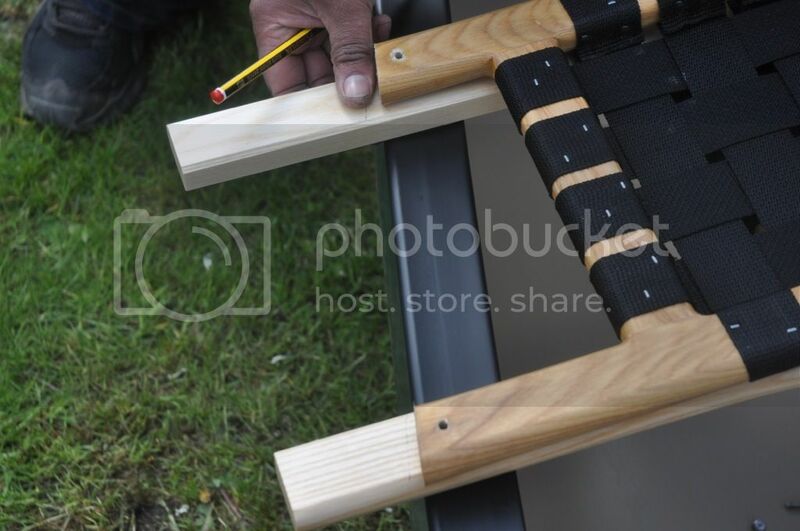 Using the original as a template for the seat bolt-holes on the new seat. 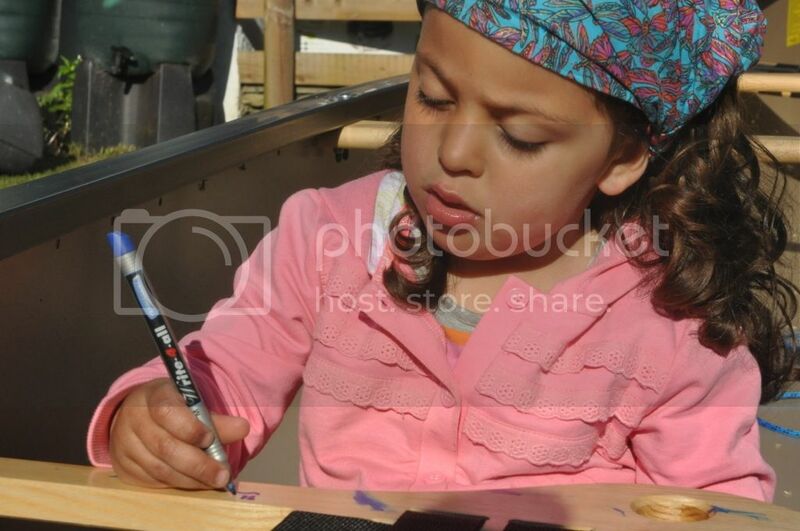 Maya Rose now thinks that marking up the canoe is a job for her. However intent the expression the lines are a bit random. Finding a good mast foot is a bit like the search for the Holy Grail. Some use a properly shaped piece of wood. 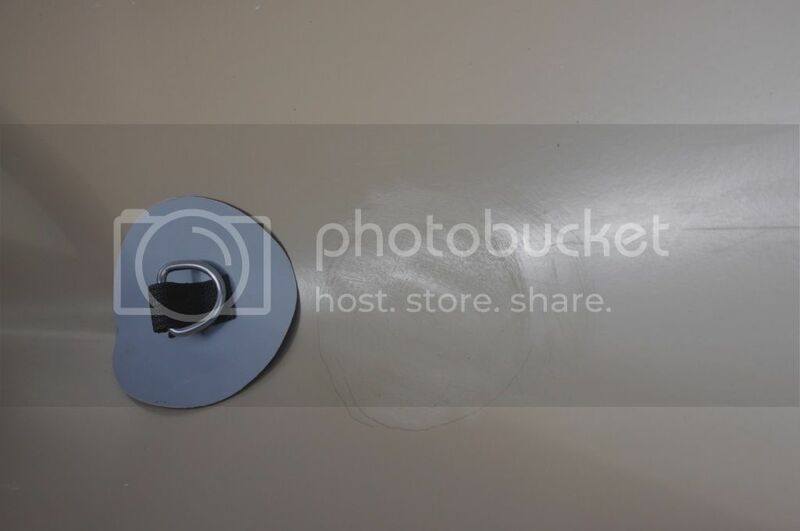 Years ago a friend of mine spotted these black rubber raft inflation valve mountings. Hard to get hold of – and my stockpile is running low – they do the job very well. They come with a metal insert which the valve screws into, this has to be cut out with a hot knife. 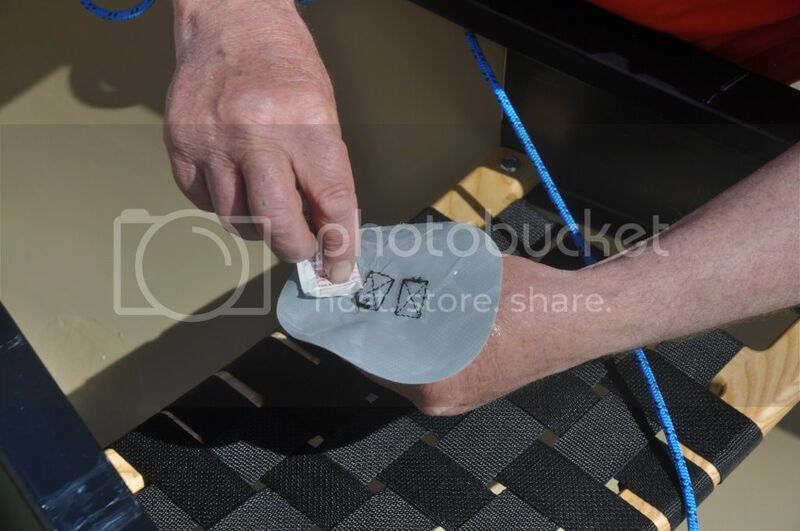 Improvised mast foot using a raft inflation valve mounting. Make sure you use the right epoxy! 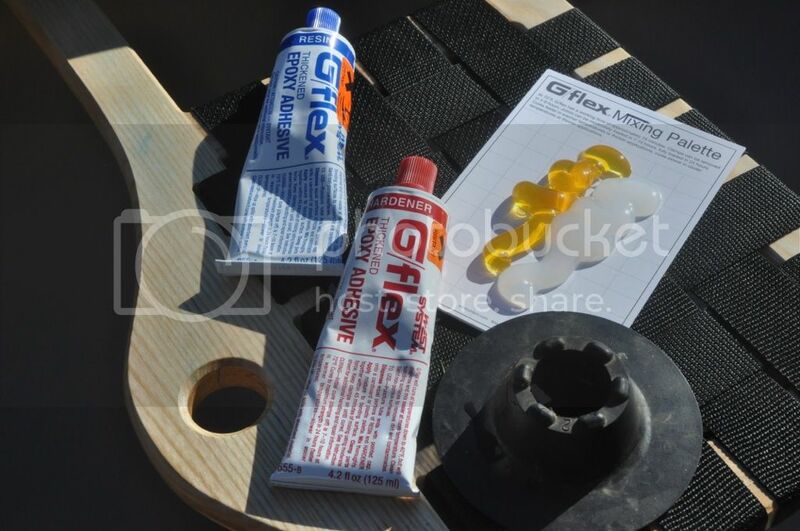 Because of the stress on the mast foot I am using a two-part epoxy (do check that it is ok with Royalex before using: I have known someone melt their boat using the wrong epoxy). Again the surface of the canoe and mast foot are sanded and prepared. Mast foot in place and boat coming together. A fair bit of pressure is needed to keep the rubber mast foot in place until the epoxy cures. An upturned open tin is placed on the foot and either a large weight placed on top or, in this case, the car jack to the right of Maya is placed between upturned tin and seat. 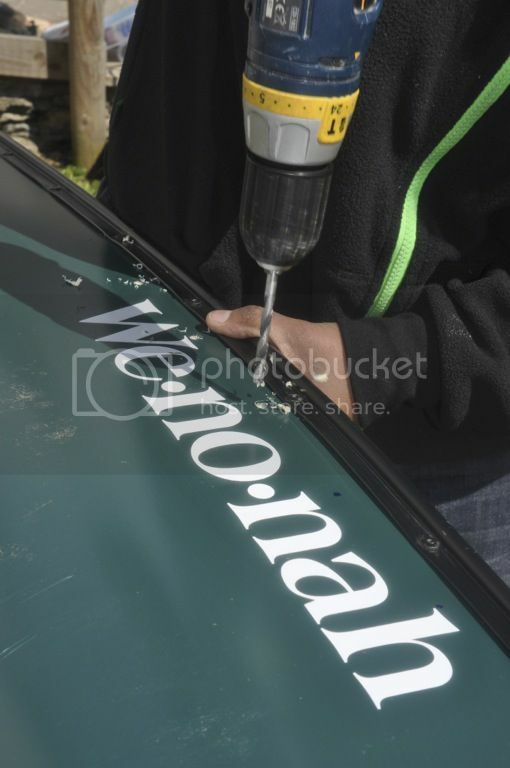 The addition of a kneeling thwart requires the final bit of drilling. The spacing of the cords (above) was pre-planed to accommodate this. 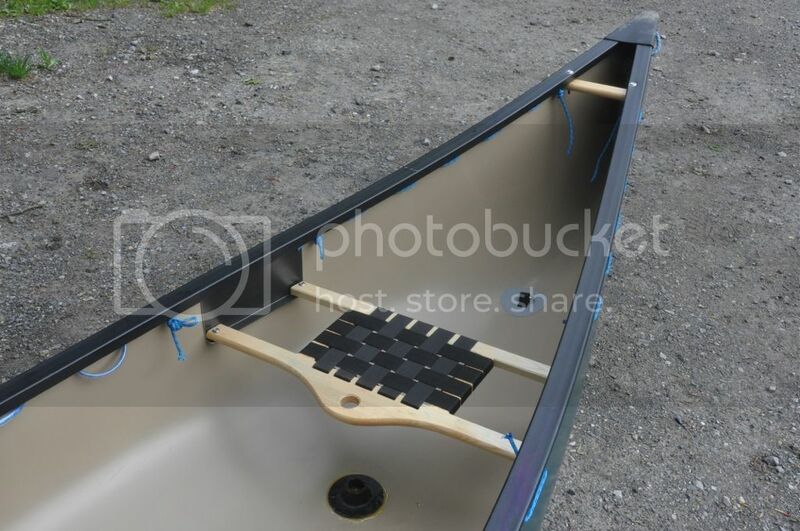 The kneeling thwart will get you into a different part of the canoe for better trim and allows good control when paddling solo. 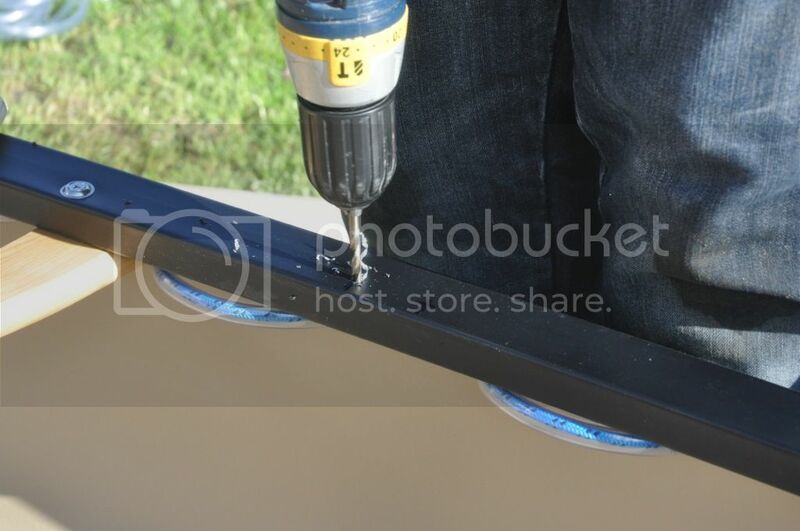 Drilling holes to fix a kneeling thwart. The only awkward thing is getting a roughly correct angle on the drill holes through the kneeling thwart. They are running at an angle, not right angles. I do it by eye. The strengthening thwart to the left will be taken out once every thing has been finished. The kneeling thwart provides the additional strengthening in its place. Attaching the kneeling thwart. The strengthening thwart to the left will be removed. 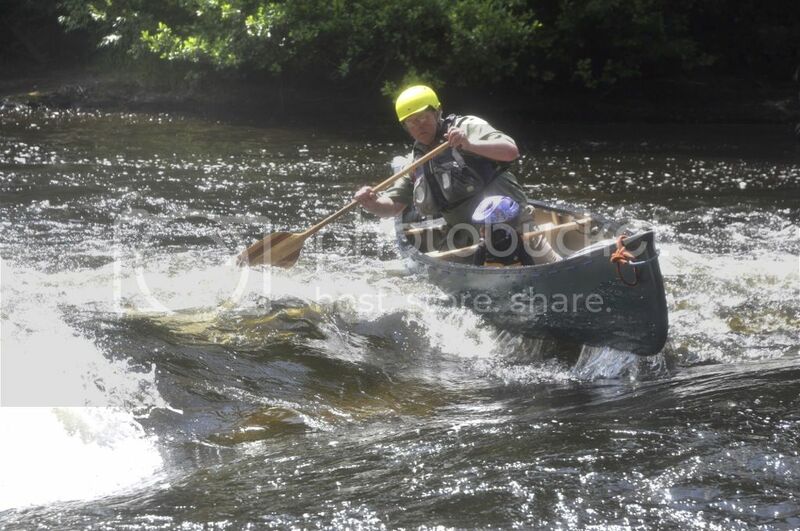 WARNING: When paddling solo on the kneeling thwart your legs are in the area of the canoe which can deform upwards in a very bad pin on white water. 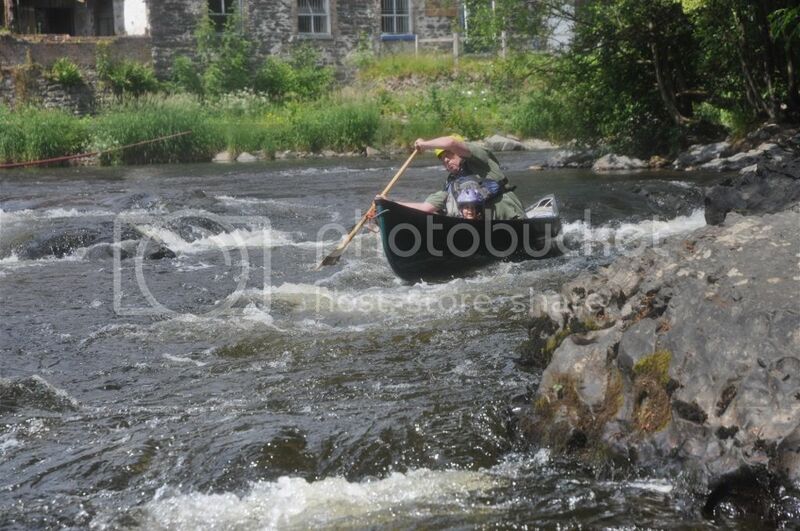 This is also of true of using the bow seat in reverse. 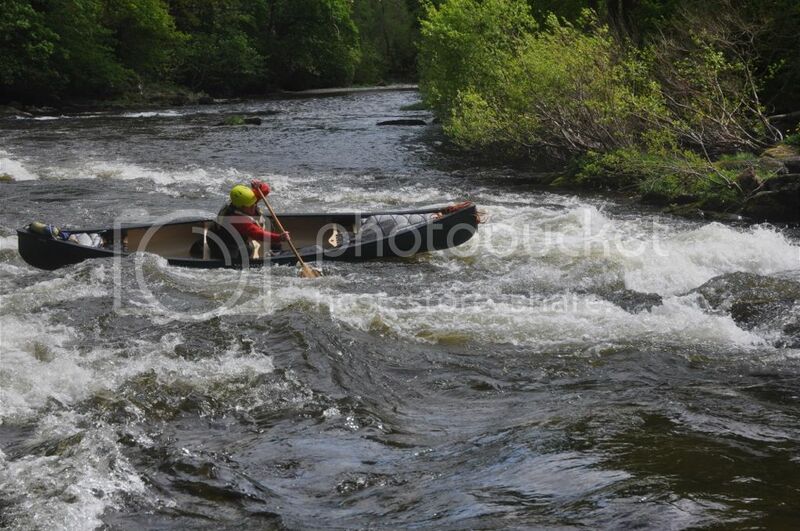 I strongly advise you – and whomever you paddle with – to carry folding saws as part of your rescue kit. I have never had to use mine but would feel uncomfortable without one. 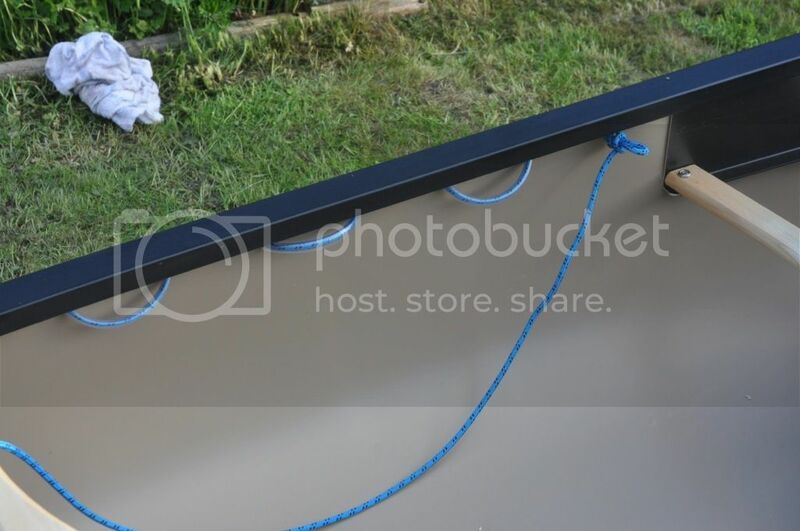 I like substantial end loop in case of a boat pin where I am going to need ropes and pulleys to remove it. This is 9mm climbing rope. Fitting an end loop of 9mm climbing rope. I want no risk of pulling the rope through the Royalex in an extreme situation. 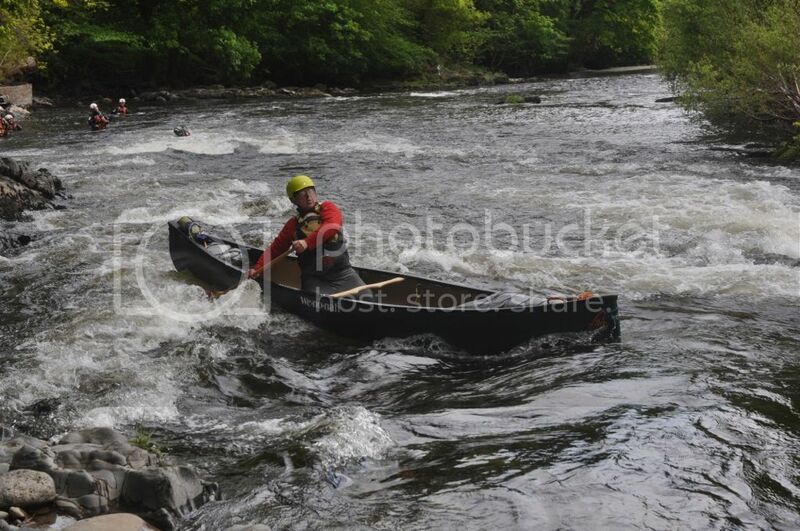 In the photo above, note the substantial spacing from the end of the canoe and from the end plate. When the end-loop is tied it should end up small enough that anyone would struggle to get a hand into it in a white water rescue. Getting a hand trapped whilst swimming down a rapid is very bad. 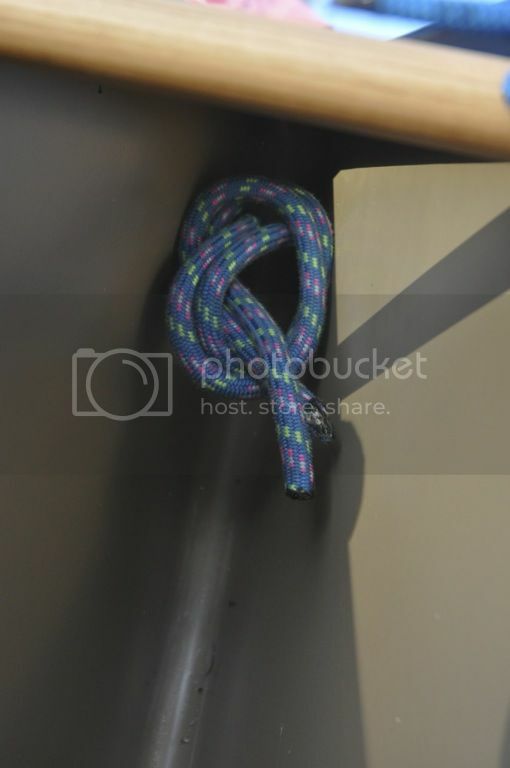 The knot on the inside is a simple overhand knot and, in the photo, has yet to be tightened. 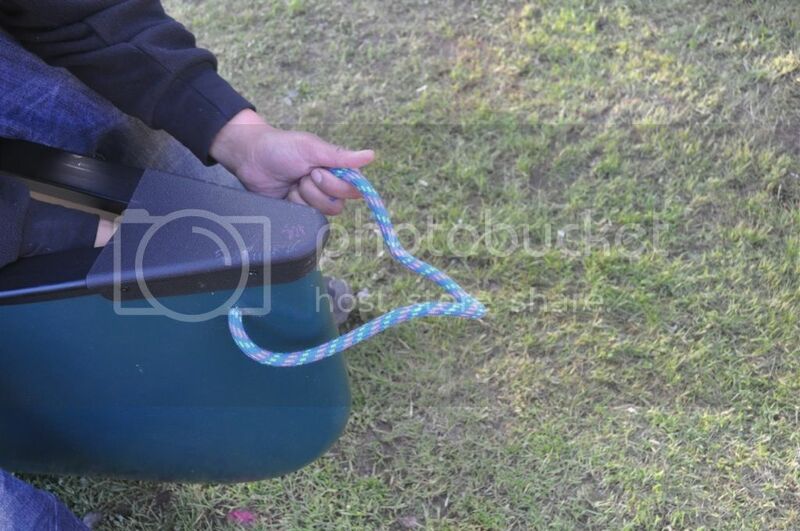 Even with this knot, the rope has a breaking strain far greater than most throw lines. Tieing off inside, using an overhand knot (still to be fully tightened in the photo). The finished boat with all attachment points and related modifications. Now that all the attachment points and related modifications have been made, we can start adding the other components. A cord goes from the airbag, through the end rope to pull the bag into the end and will then be tied off to the carrying handle. 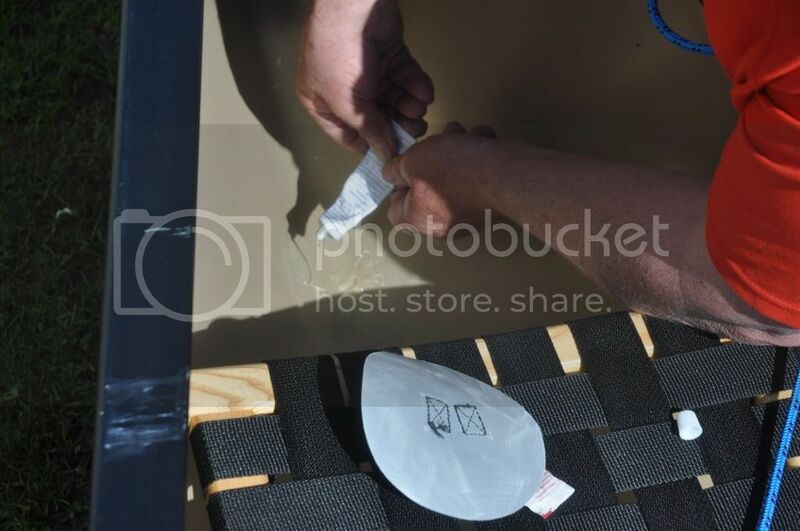 The airbag lashed into place. 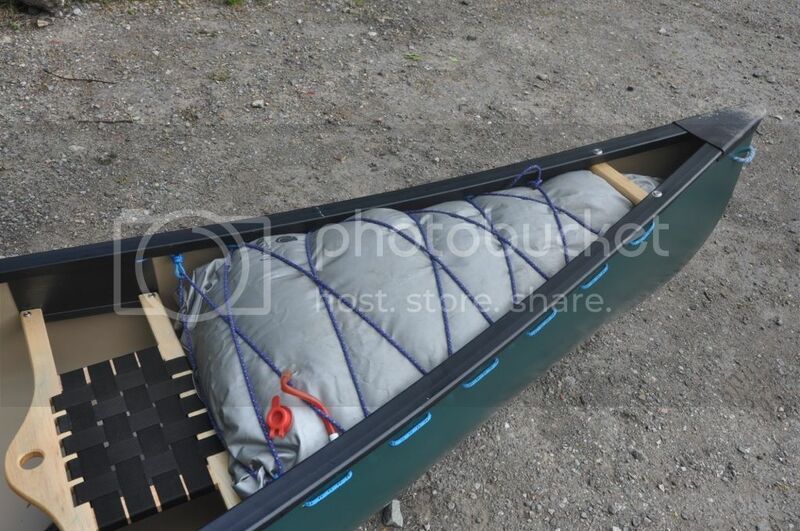 Should I want to paddle the canoe tandem I can use a smaller airbag and use the D-ring to hold it into the end. 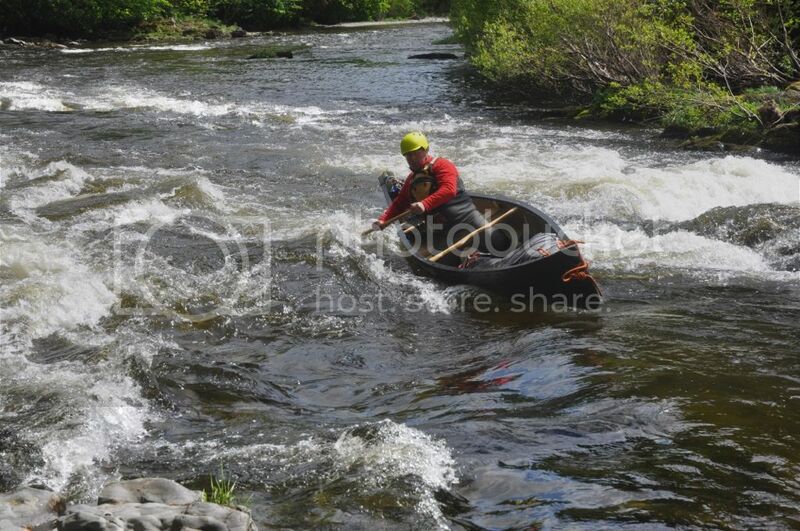 On white water I use airbags mainly to protect the canoe if I take a swim although they can give the boat enough floatation to make it possible to paddle even when swamped. Sailing using split aluminium poles as mast and gaff. The sail is by Endless River. 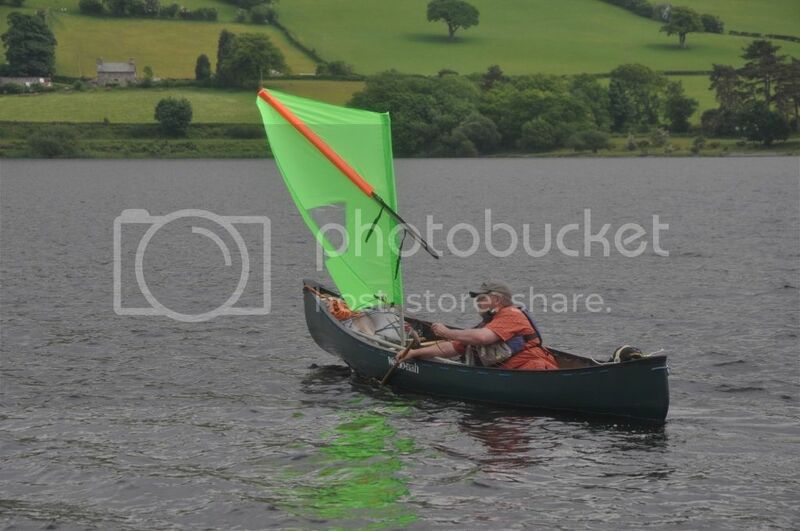 The paddle is being used as a leeboard to sail across the wind. This rig is nowhere near efficient enough to make real progress to windward but is a simple addition to the kit I normally carry. So, I hope this is of use to you. It brings together ways of outfitting I have accumulated and tested over the years. They work for me in the circumstances I am often working and travelling. Blog originally published by www.Frontierbushcraft.com (the folk I do several expeditions and courses with).